Fantastic duplex apartment with modern features, high quality furnishing perfect for large families looking for a superior holiday in Cascais, Portugal. Large condominium pool available to use which is always empty. This property is currently available for limited time only. A real gem worthy of a memorable holiday in Portugal. Taxi service available for bookings over 7 nights. Please inquire. The property includes a large living and dining room (table seats 6) overlooking the swimming pool area and sea view. Flat screen TV with lots of French, German and cable channels for all guests. The living room has two sofa, ensuring everyone can sit down and relax! The hallway leads onto the kitchen, the downstairs toilet and downstairs bedroom. The kitchen is fully equipped with a dishwasher, washing machine, dryer, toaster and everything you need to exercise your culinary activities and impress your fellow friends or family. All double beds are king size giving you extra comfort during your stay. Single beds are also wider than average and can be pushed together if required. 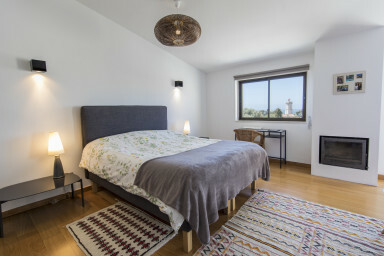 The property has a number of varandas both at the front of the property and at the back with views of the swimming pool and a sea view including the Cascais lighthouse. Locally, there are a few restaurants within walking distance from the apartment and a main food shop about 8 minutes walk which will gprovide everything you need for your holiday in Cascais. By car, you are approximately 4 minutes from the centre of Cascais and have 4 Golf Courses to choose from within a 5 km radius. Casa Da Guia, a small complex minutes from the property has a number of great restaurants overlooking the rocky coastal part of Cascais. You are also only a few minutes drive to Boca Do Inferno (Mouth of Hell) with restaurants also available there overlooking the Atlantic sea (and perhaps those huge waves crashing on the rocks worthy of a photo or two). We stayed 8 people with no problem, great design and great view.